Knightdale, NC, February 23, 2010 – Your home may be your most valuable financial asset. That's why it's important to be cautious when you hire someone to work on it. Anyone who has any experience working with contractors knows that price is not the only factor to consider. Less tangible items like your ability to communicate and feel comfortable working with your contractor often prove to be much more important with your eventual satisfaction with the job. Weather Master Heating & Air Conditioning is North Carolina’s premier home comfort specialists; and, with the cooperation of your local Better Business Bureau, have gathered ten time-tested tips for selecting the best contractor for your project. Don’t make any decisions before you check with your local Better Business Bureau and affiliated state and community agencies for a company history of complaints and resolutions to make sure the dealer is reputable.? Always ask for references: Current customers are an excellent source of information and are often willing to share their experiences.? Check local licenses: Ask to see any applicable state and local licenses, bonding, and insurance coverage.? Get a detailed written proposal: A detailed written proposal is one sign of a quality contractor. Beware of a dealer that does not back-up their offer in a detailed written proposal. ? Heat loss-heat gain calculation: Expect a thorough calculation performed with an on-site evaluation. A good contractor should measure your home, check insulation factors and evaluate your overall comfort needs.? Equipment/labor warranties and guarantees: Warranties and guarantees vary according to manufacturer and dealer. Don’t be afraid to ask questions and demand that they are included in the written estimate.? Follow contract law: Demand that your contractor follows contract law. A new comfort system is a big decision and with big decisions comes responsibility. According to New Jersey law, all home improvement contracts include a 3-day right to cancel.? Ask your contractor about the maintenance requirements of your new system: What can you do yourself and/or does the contractor offer maintenance services? A maintenance agreement is one of the best ways to ensure your system's performance, reliability and safety.? Know and understand the contract: Beware of ambiguous contracts and again, ask lots of questions. It is very important to understand all aspects of the agreement with your contractor before any work begins.? Get more than one estimate or reference: If you are uncomfortable making your decision for any reason, get two or three estimates or references and compare. More information is better than less; however, compare more than just price when evaluating estimates. Look for the best value! Many of us know, unfortunately, that choosing the wrong contractor for a home project can be very expensive. Your best bet is a reality check from those in the know: friends, neighbors, or co-workers who have had home service work done. Get written estimates from several firms, ask for explanations for price variations and remember, don't automatically choose the lowest bidder. Weather Master Heating and Air has been serving Wake, Durham, Granville, Chatham and Johnston counties since 1977. 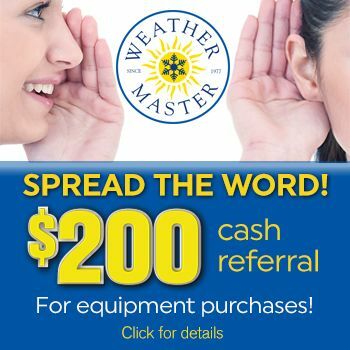 By providing the very best in air conditioning equipment and service, Weather Master Heating and Air delivers world-class service with a small-company touch. They are committed to doing “Whatever It Takes” to deliver immediate comfort to North Carolinians.